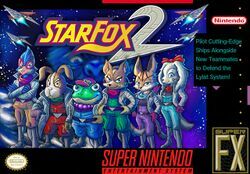 Star Fox 2 is the unreleased sequel to the original Star Fox game for the Super Nintendo. It is only able to be played because a handful of incomplete cartridges were leaked and subsequently dumped into digital format. In this game Emperor Andross, previously defeated in the first instalment of the series, has come back to wage war against planet Corneria. General Pepper calls again upon the Star Fox team for help. The player's mission is to defeat Andross' Army while preventing the fall of Corneria. The gameplay differs greatly from the original one: instead of a linear series of missions the player is able to roam freely the Lylat System, represented by an interactive map screen. The game map runs in real time whenever the player is moving or engaged in battle: enemy ships fly around, planets are conquered, missiles are fired, etc. When the player's ship makes contact with an enemy, planet or base the game changes to an action perspective for the duration of that encounter. The game ends when Andross' base is destroyed, then the player's performance is rated and scored. This guide assumes you have acquired the ROM and patched it. You can get the IPS patch from Aeon Genesis. The translation patch is necessary even if you understand Japanese, because it fixes a few bugs in the game, removes unneeded debugging functions, and allows Corneria to take damage (an important game feature without which the game would become too easy even on expert difficulty). There is no patch to fix the bugs alone without applying a translation. This page was last edited on 10 September 2017, at 05:43.